A chocolate cake recipe is a must for new housewives, mothers, aspiring bakers, and let’s just include everybody else. This Plain Chocolate Cake Recipe is the basis for all variants of everybody’s favorite treat. You can add or reduce the sugar content or augment with artificial sweetener, depending on your taste or health restrictions. This can be a stand-alone food or served with hot cocoa, coffee, milk, tea or cream. Usually the life of most birthday parties, the chocolate cake can be considered as a staple amongst sweet treats. So perfect this classic dessert and you will surely get your just desserts. Line a 9-inch round baking pan with wax paper or spray with non-stick spray, or brush thinly with canola oil (depends on convenience and availability). Stir together the dry ingredients: sugar, flour, cocoa, baking powder, baking soda and salt, in a large bowl. Add the eggs, milk, oil and vanilla. Beat with a hand mixer on medium speed for 2 minutes (or simply mix by hand using a wooden spoon until there are no lumps left). Bake for 30 to 35 minutes or until a wooden pick inserted in the center comes out clean. Cool for about 10 minutes, so the sides will not stick to the pan, before removing from the pan to a wire rack. Cool completely. range from multilevel layers and icing to multifarious toppings such as fruit, candied flowers, colorful sprinkles, et cetera ad infinitum. It’s all up to your imagination and the sky’s the limit to what you want your cake to be; trust me, with this timeless recipe, you will always have your cake and eat it too. A child’s first birthday is a cause for celebration for all parents and guardians as they have survived the first year of parenthood unscathed. It’s quite a personal affair so you need to choose the right chocolate cake recipe for this. More importantly, you need to choose the right theme or motif to decorate your cake with. I highly recommend this First Birthday Cake Recipes that will surely please both adults and children. It’s very easy to make plus the decorations can either be store-bought or home-crafted according to your taste and budget. Have a happy birthday party! Spray a 9-inch round baking pan with non-stick spray, or brush thinly with oil. Stir together the flour, sugar, cocoa, baking powder, decaf, and salt in a large bowl. Add the eggs, oil and vanilla. Mix the batter. Do not beat. Pour in the cup of cold water and mix until evenly blended. Bake for 35 to 40 minutes until a toothpick inserted in the center comes out clean. Cool for about 10 minutes, so the sides will not stick to the pan, before removing from the pan to a wire rack. Cool completely. Continue beating while adding the butter and scraping the sides of the bowl with a rubber spatula. Gradually beat in the confectioners’ sugar. Add the sour cream and vanilla extract and beat until smooth. Set aside about 1/2 cup of frosting for the pipe trimmings. Spread frosting evenly over the cooled cake. Mix in food coloring to the remaining 1/2 cup of frosting. Scoop the frosting into a pastry bag and trim the top or bottom edge of the cake. Refrigerate for about 10 mins then decorate. Suggestions: For boys, you can buy current and classic plastic action figures. For girls, you can never go wrong with pink or yellow candy flowers and mini dolls. Or you can simply go with bright rainbow colored candies and balloon lollipops all around a pretty, white carousel. Don’t forget the candle. The red velvet Bundt cake recipe has been very popular since the 1950s. The design of the Bundt pan is such that the cake is hollow in the center and has a ring shape. Not only the design of the cake is different, it is also easy to cook as the center of the cake cooks evenly. Here is a delicious red velvet cake recipe that you can make at home. The recipe caters for 1 (12 cup) Bundt cake. Grease the Bundt pan with oil and dust a little flour on the inside. In a bowl, break the eggs and add the buttermilk. Use an electric mixer to beat the egg and buttermilk mixture. Add the sugar and beat some more till the sugar dissolves. Add the food coloring and vanilla to the mix and beat some more. Add the vinegar to the mix and beat the mix well. In a separate bowl, mix the flour, baking soda, salt and cocoa powder. Add the dry ingredients to the wet ingredients, 1/4 cup at a time, and beat well so that there are no clumps in the mix. Pour the batter in the greased Bundt pans. Bake on 350F for about 45 minutes. You can check the cake by inserting a toothpick in the center and if it comes out clean the cake is done. Let the cake cool in the pan for about 15 minutes before taking it out, then cool on a wire rack before frosting. A red velvet cake is a perfect carrier for a smooth cream cheese frosting. Use an electric mixer to beat the cream cheese and butter together until mixed and softened. Add the sugar and beat at a very low speed. Keep scraping the sides of the bowl for an even mixture. Add the vanilla and beat till the frosting is fluffy. Place the red velvet Bundt cake on a serving plate and cover with the prepared cream cheese frosting from all sides. You can also melt the frosting in the microwave for some time then pour the frosting on the cake and let it pool at the bottom. Decorate the cake with sliced strawberries or chopped walnuts before serving. 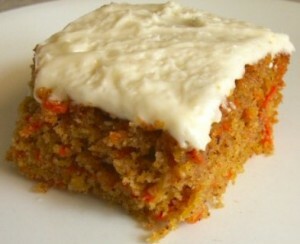 Carrot cake recipe is very tasty and nutritious. It is denser than normal cake and when you remove the sugar from the ingredients it becomes even more healthy. Here is a perfect sugar free carrot cake recipe that is moist and delicious, and is very suitable for diabetics too. – Grease two 9-inch cake pans. – Beat the egg whites into soft peaks and add in the rest of the eggs. – Stir in the applesauce, apple concentrate, water and oil and mix well. – In a separate bowl, sift together the flour, baking powder, baking soda, salt, ground cinnamon and grated nutmeg. – Add the dry ingredients to the wet mixture and mix well. – Stir in the grated carrots and fold the mix well. Add in the raisins. – Pour the batter in the greased cake pans equally. – Bake at 350F for about 25-30 minutes. Lower the temperature to 325F and bake for another 10 minutes. – Check by inserting a toothpick in the center of the cake and if it comes out clean the cake is done. – Cool on a wire rack before serving. – Blend the splenda in a mixer to make it fine like confectioner’s sugar. – Combine with cream cheese frosting and butter and beat well to make it smooth. – Add the vanilla extract. – Let the frosting chill in the fridge for some time to firm it up before using. – Place one cake on a cake stand. – Spread a layer of frosting over the top and press the other cake on top of it. – Cover the top and sides of the cake with the rest of the frosting. – Let the frosting set for some time before serving the cake. Birthdays are always important whether you are celebrating for a child or an adult. But when it comes to your child’s 1st birthday cake recipes, adding your own personal touch will make it even more special and make you feel good inside. Here is a ‘monkey face’ 1st birthday chocolate cake recipe, which is guaranteed to put a smile on your young one’s face. To create this masterpiece you will require a basic 9-inch sponge cake. Grease a 9-inch cake pan and set aside. Beat the egg whites using an electric blender until soft peaks are formed. In a separate bowl, beat the egg yolks and sugar until the sugar starts to dissolve. Add the peaky egg whites and beat the mixture some more. The trick behind the fluffiness of sponge cake is to incorporate as much air as possible. Sift the corn flour, plain flour and self-raising flour in a bowl. Add the flour mix and cocoa powder to the egg mix and fold the mix. Remove from the oven and cool the cake on a wire rack. Place the cake on a clean surface and trim 1/2 inch from each side of the cake. Cut 1/2 inch from the doughnuts. Place the trimmed doughnuts on the sides of the cut portion of the cake for the monkey’s ears. Divide the vanilla frosting in 1/2. To one-half add a little bit of red food coloring to get a very pale pink color. Cover the top half of the cake with chocolate frosting. For the lower half use the pale pink frosting to make a kidney bean type shape for the mouth. Use the M&Ms to mark the nose of the monkey. Pipe the rest of the vanilla frosting in two white circles to mark the eyes. Place the Oreo cookies in the center of the white circles. Pipe the jam as the smiling mouth. Press the chocolate sprinklers on the forehead, top of the head and under the chin. Scrape the chocolate twizzler to make the hairs of the monkey. Let the cake cool in the fridge to allow the frosting to set. Before assembling the cake you can slice it horizontally and apply some chocolate frosting in between the layers for a more chocolaty taste. Banana cakes are a healthy variation of the normal cake. Banana cake recipe goes very well with coffee and are, therefore, considered perfect for coffee evenings. However, when you combine the coffee and bananas in the cake itself it tantalizes your taste buds in a very special way that makes you want to reach for more. Given below is a simple banana coffee cake recipe with banana frosting. Grease a 10-inch baking pan. Mix the coffee with the water and set aside. In a deep bowl, beat the eggs and sugar until the sugar starts to dissolve. Add the butter to this mix and beat well until light and fluffy. In a separate bowl, combine the flour, salt and baking soda. Add the vanilla and the coffee mix and beat some more. Pour in the sour cream and the bananas and mix well. Add the flour mix in the batter, a little at a time, and beat well. Pour the mix in the greased baking pan and bake for about 45 minutes. When done, remove the cake from the oven and let it cool for about 10 minutes before removing from the pan and cooling on a wire rack. Cream the butter and salt. Add the mashed bananas and vinegar and beat to get a fluffy thick mix. Add the confectioner’s sugar, one spoon at a time, and beat to make the frosting fluffy and of spreading consistency. Remove the cake from the wire rack. Cut the cake horizontally in the center. Apply the frosting on top of one half, sprinkle some walnuts and pecans on top of the frosting and cover with the other half. Spread the rest of the frosting on the top and sides of the cake and decorate with some chopped walnuts and pecans. Let the frosting set for a few minutes before serving. Serve with a hot cup of your favorite coffee and sit back to enjoy!! Despite their slightly controversial history, red velvet cake recipe have been a hit for over a century. The first mention of red velvet cake can be traced back to 1873. The secret to enjoying the red velvety texture of this tasty cake lies in its moist and crumbly nature. Here is a simply melt in the mouth moist red velvet cake recipe that you can enjoy with or without the frosting. In a large bowl, mix the baking soda, baking powder, flour, salt and cocoa powder. In a separate bowl, add the sugar and oil, and blend on a high speed to blend well. Separate the whites and yolks of the eggs. In a bowl, beat the egg whites until almost 3 times the size. Add the red food coloring to it and beat some more. Set aside. Add the egg yolks to the sugar and oil mix and beat some more for the sugar to dissolve. Add the vinegar and prepared coffee to the mix and beat well. Add the red-colored fluffy egg white and beat the mix well so that it attains a red-brown color. Don’t worry, when ready the cake will have a nice deep red color. Add the flour mix to the wet mix, a little at a time, and beat well between each addition. The batter will be slightly more liquid than usual cake batter. Grease two 9-inch baking pans using a little oil and flour. Pour the batter in the pans and smooth the tops. Bake in the preheated oven for about 30-40 minutes. You will know that the cake is done when the top is springy. Remove from the pan and cool on a wire rack before serving. The cake can be served as it is or served with the frosting of your choice. Here is simple cream cheese frosting recipe. In a deep bowl, mix the cream cheese, milk, vanilla and butter. Beat on medium to high speed until smooth. Add the sugar and beat some more until you get a smooth thick frosting. Layer the cakes on top of each other with a thick layer of frosting in between them and cover with frosting all over. Chill for a few hours and your cake is ready to eat. Carrot cakes are fun to eat and very nutritious. The carrot cake recipe is considered to be one of the healthiest desserts. Carrots are rich in vitamin A, which is considered to be essential for good eyesight. As the carrot cake has loads of carrot in it along with walnuts, pecans, raisins, coconut etc, its nutritional value increases two-fold. Here is a nutty homemade carrot cake recipe that is very filling and super tasty. Grease two 10-inch baking pans. In a large mixing bowl, add the eggs, vegetable oil and sugar, and beat them on a medium speed for about 4 minutes until the sugar dissolves and you get a smooth white mix. Add the cut pineapple and grated carrots to the mix and beat at a very low speed to mix the ingredients. Stir in the walnuts, raisins and coconut flakes. In a separate bowl, sift together the flour, baking soda, baking powder, cinnamon powder and salt. Add the dry ingredients to the wet ingredients and mix well so that you get a cake mix of dropping consistency. Pour the batter in the greased pans and smooth the tops. Let the cake cool for about 30 minutes before applying the frosting or serving. This cake can be stored for about 2-3 days in an airtight container. You can even freeze the cake for later use. (i) Cut the cake in three layers and apply frosting on each layer and also cover all the sides. (ii) Apply frosting on all the sides of the cake and garnish with coconut flakes and nuts. (iii) You can also use fresh cream to serve with the cake. (iv) When using caramel sauce, warm the cake a little before serving. The secret weapon to the success of every dinner party is beautiful chocolate desserts. There are many ways to use the ever popular chocolate cake recipe in dessert, but it is the plain chocolate cake that is the most popular of all. A plain chocolate cake with some frosting is all you need to finish off the scrumptious dinner that you prepared. Here is a plain chocolate cake recipe that you can prepare in no time. Grease an 11-inch cake tin or two 7-inch baking tins using a little flour and oil. In a deep mixing bowl, add the butter, sugar and eggs, and beat at a very high speed using a food processor or blender until the mix is smooth and creamy and almost double in size. Add the milk and coffee to the mix and beat some more. Don’t forget to scrape the bottom of the bowl in between so that all the ingredients are fully incorporated. In a separate bowl, mix the flour, cocoa powder, baking soda and baking powder. Add this mix to the egg-butter mix, adding one large spoon at a time and beating well in between each addition. Pour the mix in the prepared cake pan and smooth the tops. Bake in the preheated oven for about an hour. At the end of the baking time you will have a nice dark brown chocolate cake. Let it cool in the tin before removing from the pan. The chocolate cake is incomplete without some delicious cream decorations to go along with it. Here is the recipe for a delicious chocolate cream that perfectly complements the chocolate cake. Heat the cream in a saucepan until very hot. Remove from heat, add the chocolate, and stir well. Slather the prepared chocolate cream on the cake covering all the sides. Decorate with sliced raspberries and serve with some fresh cream on the side. Yummy banana cake recipe is easy to make if you are using a cake mix. It also cuts down the preparation time to a great extent. Moreover, you can add your favorite nuts, such as cashews, pecans etc, to the mix to add a nutty flavor and serve it with the frosting of your choice. Given below is a mouth-watering banana cake recipe with cake mix and a delicious caramel frosting. Grease two 8-inch cake pans using the vegetable shortening and dust some flour on the inside. In a deep mixing bowl, take the cake mix and add the cinnamon and brown sugar to it. Break the eggs in the mix, one by one, and beat between each addition. Add the vegetable oil and water to the mix. Beat the mix well with an electric mixer and make sure that you scrape the sides of the bowl in between the mixing so that the ingredients are well incorporated. Pour the batter in the two pans (filling each pan to the ¾ level) and bake in the preheated oven for about 30-35 minutes. Once the cakes are done, let them cool for at least 30 minutes and, in the meantime, you can prepare the caramel frosting. In a thick saucepan, take the butter and brown sugar and heat for about 2 minutes until they both melt. Once the mixture starts to boil, add the milk and mix. Bring the mix to the boil once again. Remove from heat and stir in the vanilla and icing sugar. Keep in mind that this frosting has to be used warm, otherwise it will harden. Take one cooled cake and place it on a cake stand right side up. Spread a layer of frosting on the top of the cake and sprinkle some roasted nuts over it. Place the other cake on top of it and frost the top and the sides of the cake in quick motions (so that the frosting does not cool). Cool the cake in the fridge for 1 hour before serving.